Kroger, a somewhat larger grocery store chain, has recently started pushing their organic products, which they're labeling "Simple Truth." 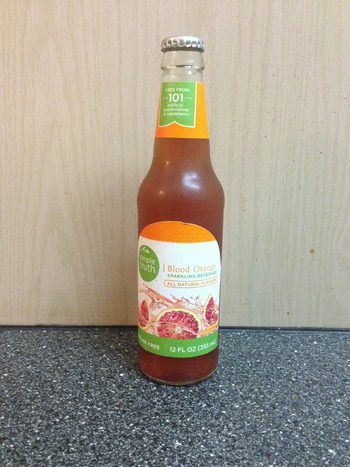 Until yesterday when someone brought me a bottle of their Blood Orange so...er, sparkling beverage, I had no idea they were branching out this far. The ingredient list is fantastic: sparkling water, cane sugar, apple and blood orange juices from concentrate are at the start. Nothing concerning after, in fact the coloring is from additional fruit and vegetable juices. Even the front of the bottle boasts "Free from 101 artificial preservatives & ingredients." To be fair, it is probably free of many more than 101, as I'm certain there are more than 101 ingredients in the world, but maybe they mean in comparison to your normal blood orange soda. Not that that's a normal thing. Which is where my initial concern came in. I'm not a huge fan of "alternate" orange sodas, like tangerine. At one point Minute Maid had, if I recall correctly, a tangerine orange soda, and not standard orange, and it was terrible. It was like a dry orange soda. Hardly sweet with a dull orange flavor. Thankfully, the Simple Truth Blood Orange is far, far from that. I don't know if you're familiar with "Slush Puppie," but they're a brand of slushes sold in schools. Sure, lots of schools have full-blown fast food restaurants in them now, but ours did not. The only fancy thing we had was a Slush Puppie machine. I never once bought my lunch at school cause, well, that's disgusting, and they hardly gave you any food, but I would often partake in a Slush Puppie. Getting to the point, my favorite flavor was orange, and I would drink it though the straw, but I would bite down, making sure I only got the syrup and none of the tiny ice chunks. No joke, this tastes just like that. I'm sure that the Slush Puppie had a few more than 101 artificial preservatives and ingredients, though. So, yeah, this is good stuff, and it makes me excited to try some other Simple Truth products. Now I understand why the person who gave me this said they drank the other three prior that day. Verdict - Buy a Pallet!